ATLANTA, Ga. — Safety. It’s a word that’s emphasized in some professions more than others. People often think of firefighters, police officers, and soldiers when they think of bravery in the workplace. While there’s no doubt that these individuals are among the most courageous, underground miners are another group specialist who strive to create a safe environment on a daily basis. In recent years, a string of high profile mine explosions have exposed the danger posed to those working underground. Explosions are just one of many hazards that come with underground mining — lack of fresh air, confined space, and the reduced visibility are others. Miners bravely go into this environment on a daily basis to fulfill their commitment to a job well done. Strata Mine Services is one company that helps to ensure the safety of those working underground. A division of Strata Worldwide, Strata Mine Services is a contracting service company. Mining companies, both large and small, count on the expertise and assistance of Strata Mine Services, and will contract with the company to do a variety of projects – everything from general labor to ventilation controls. “One of our specialties is in the application of shotcrete as underground reinforcements for use with spray panel overcasts,” said Jeff Waggett, PE, senior development engineer for Strata Mining Services. Spray panel overcast systems are often used by miners to ensure proper ventilation underground. Constructed of lightweight panels, overcasts are designed to block a passageway or prevent the mixture of airflow at the intersection of two passageways. “As one can imagine, ventilation is a crucial element of underground safety so it’s a major component of our offerings,” Wagget said. These structures consist of two layers of wire mesh with polystyrene in between each layer. The layout is similar to that of a highway overpass, except in this case, it’s air (not vehicles) that is being redirected to avoid collision and the result of mixed air supplies. Before the structures can be deemed complete, they must first be reinforced with wet or dry process shotcrete (gunite). Wet shotcrete is the process of pumping a low slump concrete material to a discharge nozzle where compressed air is injected allowing the material to be sprayed on to vertical and overhead surfaces. Dry shotcrete (gunite) is the process of introducing a dry or predampened shotcrete material into an air stream that conveys the material to a nozzle where water is injected in to the material. Both processes require special equipment to apply the material. Specialized construction work such as this is part of Strata’s repertoire. As exemplified by the work it does, Strata also has a long-standing commitment to safety, with quality work and customer service key to its core values. In order for the company to provide this elevated level of service to customers, it needs reliable equipment from trusted suppliers. Blastcrete Equipment Company is one such supplier. Based in Anniston, Ala., Blastcrete Equipment Company provides a variety of wet and dry shotcrete equipment. With more than 60 years of experience in the manufacturing industry, Blastcrete has established itself as a company committed to providing high value equipment for enhancing mine safety. The company offers a variety of mixer and pumps in its product line. Waggett began working with Blastcrete in June of 2010 when he purchased customized versions of the company’s AA020 Piccola gunite machines. At the time, Strata was using the dry gunite process almost exclusively for the overcast systems, and Waggett was looking to add some new machines to the mix. Strata had been using dry process shotcrete, as it had been the industry standard. But gunite certainly comes with its share of drawbacks and Strata was really beginning to notice the negative implications. Because it’s a dry-mix process, gunite applications produce a lot of dust, which is a major problem in underground mines, where air ventilates throughout the entire mine. Once that air is laden with dust, it will circulate to the other areas in the mine – a serious health and safety concern. Strata had been exploring the idea of using a wet-mix, or wet shotcrete, process to combat some of the issues posed by the dust. Typically, a wet-mix shotcrete process generates less airborne particles and rebound (waste) than gunite, simply because the material has 100% of the moisture added to it. Another advantage is the speed factor; wet shotcrete can be applied much faster than gunite. The Strata crew had actually even tried to utilize wet shotcrete for overcast installations on a few occasions. But while the process cut down on some of the safety issues associated with gunite, the equipment system wasn’t as efficient. “We didn’t have any wet shotcrete equipment that was compact enough to actually go underground, so we had to do it from the surface,” Waggett explained. The lack of compact equipment meant there was a large divide from the surface where shotcrete was being pumped, to where the application was actually taking place underground – resulting in a less efficient process than the traditional gunite method. So in May of 2011, familiar with Blastcrete’s willingness to customize solutions to his company’s specific needs, Waggett approached Blastcrete’s Sales Manager, Tripp Farrell, with another challenge: Solve the problem of inefficiency with a customized machine. What Waggett ultimately wanted was a machine that could operate underground and allow the crew to mix and pump right inside the mine. This would combat the lack of efficiency with the company’s current shotcrete process. “I was confident the crew at Blastcrete would provide us with what we needed,” he asserted. And he was right. Early that summer, Blastcrete met Strata’s challenge with the Mine Mate. The Mine Mate, a new machine featuring Blastcrete’s X-10 high-pressure swing tube pump, can apply up to 12 cubic yards per hour. The machine also includes a high-shear continuous mixer. Perhaps most importantly, the Mine Mate is designed to be compact enough to work underground. Waggett was also very pleased with how easy the Mine Mate was to clean. One of the misconceptions and deterring factors about using wet shotcrete equipment is that it needs more attention than gunite machinery. While wet shotcrete equipment does require more immediate attention after operation, both types of machines require frequent cleaning and maintenance. But Waggett noted that cleaning and maintaining the Mine Mate has been quick and easy every time, particularly thanks to Blastcrete’s innovative continuous feed mixer. The mixer is easily cleaned by removing the mixer housing and flushing. The pump is simply engaged in reverse and flushed with water until the swing tube and material cylinders are clean. 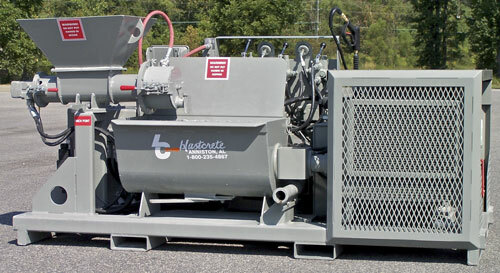 Beyond customized and user-friendly equipment, Blastcrete also provides excellent customer service. The domestic nature of Blastcrete’s operation allows Waggett’s crew to reduce downtime. Replacement parts can be overnighted from Blastcrete’s facility in Anniston, Alabama. And the significance of reducing downtime can’t be overstated, especially with safety and lives at stake. The Mine Mate continues to help Strata provide safe and efficient overcast installation, but Waggett and his crew have kept the machine busy with other tasks as well. The crew often detaches the wet shotcrete nozzle in order to simply mix and pump concrete for various underground applications. It sounds simple, but according to Waggett, “It’s very convenient and provides us with the versatility we need for several applications.” This convenient and versatile nature has allowed the Mine Mate to benefit crews in various tasks. With a commitment to safety a core value of the company, Strata Mine Services has found the key to meeting that goal is a combination of finding the right equipment to ensure productivity and refusing to settle for anything less than the ideal solution. In both cases, Waggett credits Blastcrete with being an essential element in the mix, providing Strata with concrete results and a safer environment in the mine.